Several eyebrows were raised when the hammer came down at $17,500 plus10% buyer’s premium, plus tax on a carved cane at the October 1st Jim Anderson auction in Jarvis this past October 1st. Lot 101 was described in the catalogue as an “exuberant and imaginative work attributed to James Beaver. This technically proficient piece features a carved beaver as the hand piece of the cane, well carved in an early style”. Dealer chat beforehand suggested that it should come down around the $4-6,000 mark if it was anonymous. Anyone’s guess with the attribution to Beaver. We were all surprised by the outcome. It was however no surprise that it went to a dedicated collector of his work who is known to have collected over thirteen paintings by the artist. Known as “The Six Nations Artist”, Chief Beaver travelled the Grand River from Caledonia to Brantford in the 1890’s, painting houses and business buildings for a living. During his life span from 1846 to 1925 he lived at Beaver’s Corners near Ohsweken on the Six Nations Reserve. A gifted man of many talents, he was known as a carpenter, a wood-carver, a juggler and a showman, as well as a painter. 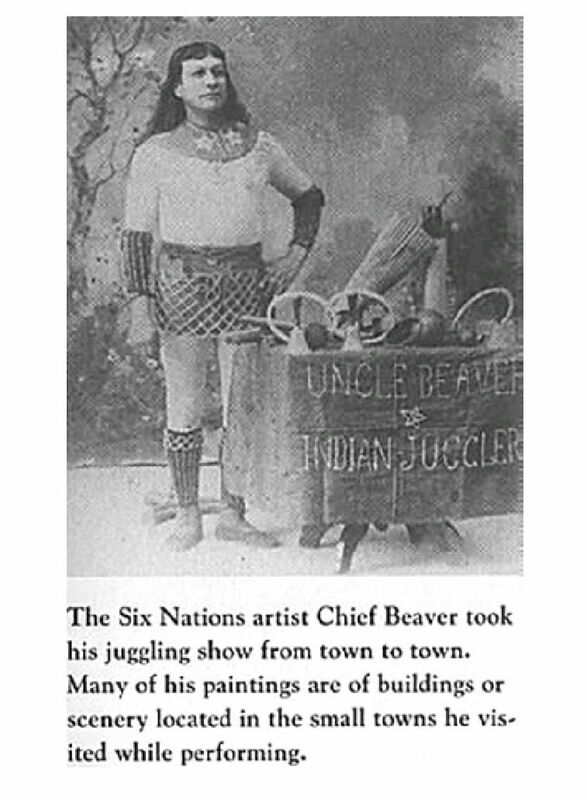 On stage, he was “Uncle Beaver” as he travelled across Canada and the United States with road shows, carnivals and medicine men. Today some homes on the Reserve still retain samples of his woodworking and fine carpentry skills. Jim Beaver and his wife, Lydia (Bay) from a Mohawk Reserve in Quebec, raised three sons and four daughters. Granddaughter AIta Doxtador remembered being impressed by a concert her grandfather put on in Christ Church at Beaver’s Corners and the canvas backdrops he painted for the occasion. She also remembered seeing him seated in front of his easel. Because he couldn’t read or write, he once asked her to write TITANIC on a paper for his painting of a ship. I currently have a Beaver painting of flamingoes which is one of his more generic Victorian scenes that he would have sold from door to door. You can view it on my shadflyantiques.com website; and there are examples of his furniture, at the Chiefswood Museum near Oshweken, and other examples of his painting and carvings at the excellent Woodland Cultural Center in Brantford.